Check out AniModule's Line to Synth Level Converter. 2 Channels of 1 in 2 Out. Each channel is designed to multiply your input by *3 to boost your Line Gear / Tablet / Phone so you can integrate audio OR Control Voltages from your auxiliary systems. Each channel's input is designed with Line Level gear's input impedance in mind. 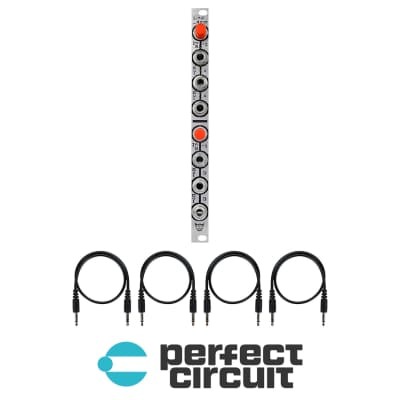 Perfectly compatible with Synth Output Impedances, but the standard Synth Input Impedance is higher than Line level equipment is expecting. Don't need to amplify your XPhone right this minute? Never fear! Just Hit the Switch! This module won't sit unused in your cabinet breeding resentment and dust bunnies. Hit the switch and that channel becomes a normal 2 HP Unity Gain Buffered Mult. Only need one channel of each? It's YOUR Choice!